Sprite DLight has been funded on Kickstarter! 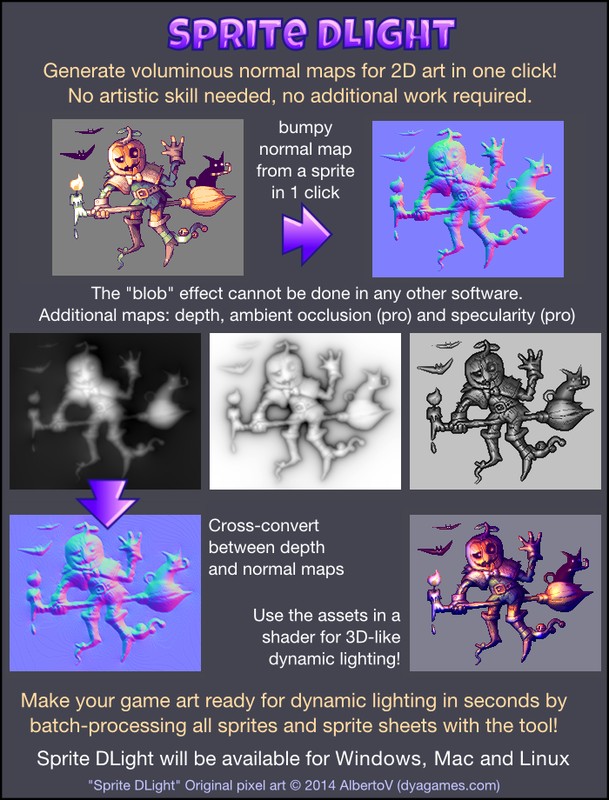 Sprite DLight is a tool providing a new generation of voluminous one-click normal maps from 2D sprites like pixel art for dynamic lighting effects in games. You can still back Sprite DLight via PayPal and jump in for beta testing. Become part of the project and purchase the PRO version now (includes beta access)! Note: It can take up to a few hours until you receive the mail with the current build after your payment! Sprite DLight got greenlit by the Steam community, so it will be available on Steam when the time comes. Thanks to everybody who voted! Normal maps for 2D sprites in 1 click! These are just some basic impressions, more of the tool's power can be seen on the Kickstarter page, which also contains three videos and detailed information on many different aspects of Sprite DLight.